Our Munich insiders say that the K1600R will be revealed in 2014 which seems to coincide the recent BMW K1600R spy photos we have been seeing during hot weather testing in Arizona. The lightly camouflaged machine shows a half fairing similar to that used on the K1600R and also some novel wind deflection ailerons at each side of the fuel tank. One aspect of the New K1600R that we think Motorrad fans will love is the low slung exhaust and large rear 200 width tire. The wheels have also been modified, now with 5 spokes instead of the multiple Motorrad sport wheel offered as an option on the 2013 models. 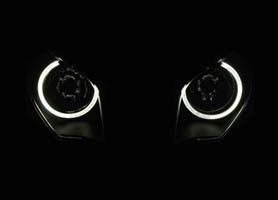 The “angel eye” lights on the BMWK1600R are being brought from the BMW automobile stable and will feature as twin headlights with a black background on the snout of the bike offering an animal like look to the pointed front. We expect the K1600R to be available for order around March, although the unique engine design (again by UKs Ricardo engineering) could mean that volumes of these units will begin to ramp up mid 2014 to satisfy the bourgeoning demand for the K1600R.